This post is somewhat overdue, but it’s time to talk about the tragic events that have been unfolding in Japan recently. There’s perhaps no need to go into too much detail, we all know about the earthquake and subsequent tsunami that has caused immense devastation, and loss of life there, we all know they face a very tough time ahead, and can do with all the help they can get. The games industry obviously has special ties with Japan. These people are our colleagues, friends, family, team mates, opponents, compadres, buddies… you’ve played their LittleBigPlanet levels, and they’ve played yours. That’s why people from within the games industry have come together to build the Play For Japan campaign. Play For Japan aims to channel the passion and generosity of gamers into a relief effort, through events, donations, and auctions of rare and interesting gaming memorabilia. That’s where we will be joining in, with five auctions we hope will raise some much needed cash for those in need. All the money raised will be donated to the Red Cross Appeal. Own a piece of LittleBigPlanet history! We have framed four pieces of artwork by Francis, the chief creator of Sackboy. They show some ideas for the development of our beloved hessian chum, and if we may be so bold, each one is a piece of gaming history. In the words of Indiana Jones, they belong in a museum! There are four of these pieces of artwork, each one is different, and as they are the originals, they unique. Each framed sketch comes with a very special copy of LittleBigPlanet comes with a special uber rare ‘Mm Special edition’ box art slip that has been signed by the whole team here at Media Molecule. (One of them has even been signed twice by me, double value, not at all a mistake!) There are only a very, very small number of these custom covers in existence, they were originally intended to be owned only by Media Molecule staff. Go bid on these auctions! Buy your way into royalty. This is an auction for an in-game crown item for your Sackboy. These are very rare, and usually reserved for competition winners and people who go above and beyond the call of duty. This is your chance to buy yourself into royalty. Some may see this as cheating, but by winning this item you will be aiding people in need, and we think that is worthy of recognition, naysayers be damned, this is for charity! Bid on the auction for a Crown. 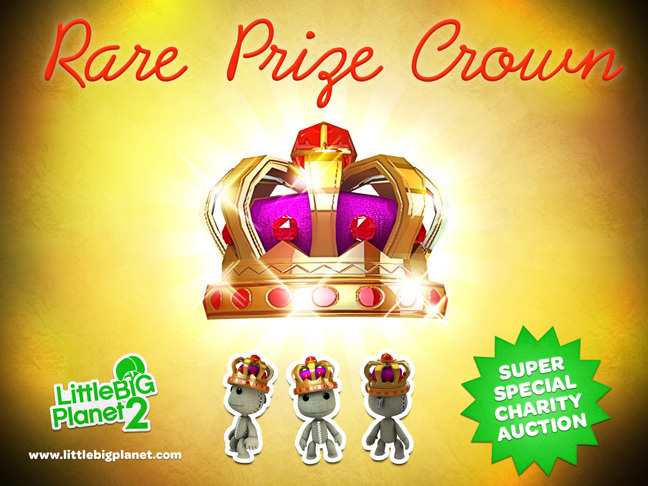 Ebay took our Crown auction down, so we have re-listed it as something slightly different - it’s an even sweeter deal now, a Regal edition of LittleBigPlanet 2, and a crown too - check it out! All these auctions are available now via ebay, 100% of the profits going to charity. Go forth and bid generously, and remember to check out the big list of other items being auctioned by Play For Japan - there are some great chances to own some rare items! Thanks people!